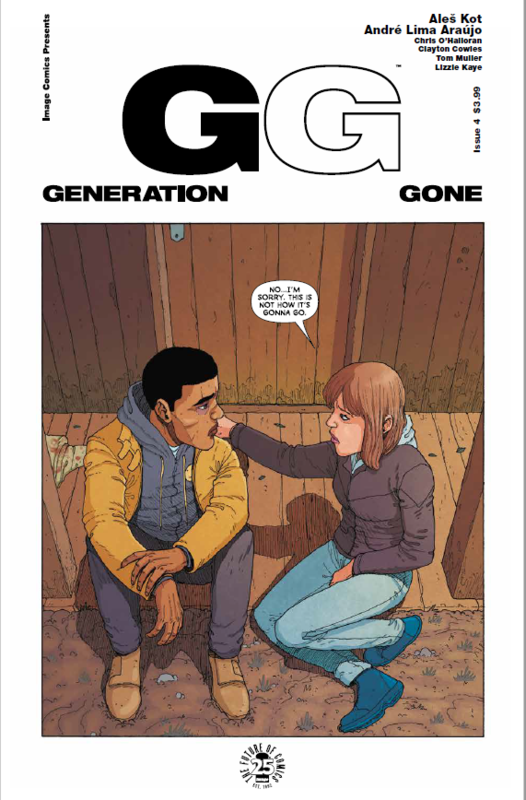 Generation Gone #4 review: Sides are chosen – AiPT! It seems that it’s time for Nick to get his revenge, no matter who stands in his way. If any line sums up Generation Gone, this is it. After an issue treading water, the generation gap widens greatly as our protagonists seek their place in this new world, created by science and fear, forced upon them by forces out of their control and without enough knowledge or forethought to predict the chaos wrought. They each define themselves by their past, hoping that, somehow, their future will be better, despite all evidence to the contrary. Brandon defines himself, briefly, through his longing for Alice. He confesses that he stood by, waiting for her to notice him. Like too many who see themselves as “friend-zoned,” he imagines that he is owed something for his unrequited patience. Nick is defined by his past, clinging to anger over his brother’s death, blaming the government that seemingly now has granted him this super-strength. Alice’s self-worth is determined by others. By Nick, to whom, despite all he has done to her and others, she still clings. By Brandon, her friend who saw himself as savior in the wings. By her mother, dying. All of the characters, protagonist, antagonist, or otherwise, are all looking for the same thing: control. They have all lost something; they all feel lost. There are a myriad of excuses, but none fill the holes left. Each seeks, in their own way, to take control over their own lives and gain some agency. Alice takes that step as she confronts Nick, offering him one final way out of the situation he feels is his inevitable destiny. After moving each character around the hero/villain continuum, including Dr. Akio, the General and the “government” itself, it seems we finally have lines drawn in the sand. With a tilt-a-whirl piledriver to Alice and a hearty handshake with Dr. Akio, Nick takes control of his future. Only time will tell which side of the continuum he stands on. In his own mind, we know he sees himself as a victim. It seems that it’s time for Nick to get his revenge, no matter who stands in his way. After moving each character around the hero/villain continuum, including Dr. Akio, the General and the "government" itself, it seems we finally have lines drawn in the sand.